Objective: The aim of our study is to examine the impact of comorbidity on cognitive parameters after the first ever ischemic stroke. Material and methods: We examined 112 patients (aged 46 to 84 (66.67± 5.96), 69 males and 43 females) with first ever ischemic stroke. For cognitive assessment we used Mini Mental State Examination (MMSE), 10 word test (for short term memory and delayed recall), Isaack’s test for verbal fluency (VF), Geriatric depression scale (GDS), Hamilton depression scale (HDS), Blessed dementia information memory concentration test (revised, BDIMCT), Benton Visual Retention test (A,E; BVRT) – number of corrects and number of errors and Wiskonsin Card Sorting Test (number of errors, WCST). The patients were examined on two step model. At acute stage, after collecting medical history, somatic and neurological examinations, MMSE, 10 words test and HDS were applied. At subacute stroke stage (90±5 days after first stroke symptoms), all cognitive tests were used. „STATGRAPHICS Plus 5.0 (free version)” was used for statistical analysis. Results: Chronic ischemic heart disease and chronic obstructive pulmonary disease are the most important additional risk factors for cognitive decline. Thyroid pathology, renal failure and anemia are independently associated with poststroke depression. Conclusions: On the basis of these data we can conclude that vascular risk factors are independently associated with cognitive and emotional changes after stroke and their effects should be assessed and taken into account for subsequent treatment of stroke survivors. Key words: comorbid diseases, postroke depression, poststroke cognitive impairment, vascular risk factors. Please cite this article as: Valkova M, Stamenov B, Peychinska D. THE IMPACT OF COMORBIDITY ON COGNITIVE PARAMETERS AFTER ISCHEMIC STROKE. J of IMAB. 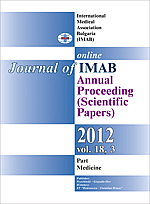 2012; 18(3):298-301. doi: 10.5272/jimab.2012183.298. 9. Conradi AO. Antihypertensive therapy in prophylaxis and correction of cognitive impairments. Consilium Midicum, 2005, 1(3). 13. Titianova E, Velcheva I, Stamenov B. Treatment of Acute Ischemic Stroke with Thrombolysis in Bulgaria. Neurosonology and cerebral hemodynamics. 2010; 6 (1):15-19.